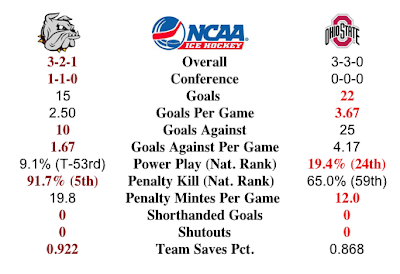 For the second consecutive year, Minnesota Duluth will play Ohio State finishing off a home and home two year commitment. Last season the Buckeyes came into Duluth to start each team’s season and a split ensued. Frankly both teams came out in about the same place last year in regards to record and not qualifying for the NCAA Tournament. This year should be different when these two teams meet. Ohio State has been a wreck in this early season. They can score goals, but the defense is so porous, they just can’t score enough. Thus OSU’s 3-3-0 record with wins against the likes of Robert Morris (2) and Bowling Green. UMD, conversely, has had stellar, almost record breaking, defensive success this season. But at times the offense cannot take advantage (literally on power play) and score enough to win. It has been a season of close losses and some big wins for the Bulldogs. UMD's 1.67 goals allowed per game is tied for third best in the nation and ties a school record for best after six games. 59 teams compete in Division I. That leaves the Buckeyes dead last in penalty kill. Looking at their opponents so far, that is a bad omen for OSU. Lucky for OSU, UMD is nearly as inept at power play as OSU is at penalty kill. Only five teams fare worse than the Bulldogs on PP. This is a good match up for the Bulldogs. As UMD moves through their season goals, this is a good test to see if they are a "trend or mirage." Picks by @afiskness. Picks to come as Fiskness is taking care of his real job first. We will update when picks come in.